FirstLight HomeCare offers comprehensive, in-home, non-medical and personal care services to seniors, new mothers, disabled adults and others needing assistance. Based in Cincinnati, Ohio, FirstLight's management team brings more than 170 years of collaborative experience in health care, franchising and senior services, creating the core of FirstLight's foundation. ClientFirst – A unique tool that matches specific caregivers to client's needs and habits during the initial transition to in-home care. 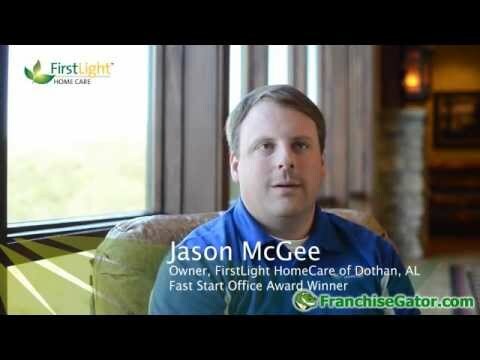 Jason: Hi, this is Jason McGee, FirstLight Home Care of the Wiregrass. Were located South Alabama in the Dothan area. Our market is primarily Dothan, Troy and Enterprise. I share similar vision as FirstLight when I met the team at the corporate office. Theres a willingness to expand services and really have a high level quality of customer service. My best moments at FirstLight, I would say closing your first deal and we did that in the first couple of weeks. Then probably closing an ever bigger deal or live-in. I would say some of the challenges that weve had in the past is the caregivers in recruiting, coordinating through our efforts together. Obviously, when you got some good leads coming in, youre closing those deals and then trying to get the right caregivers on-board; its just working through that process. How we turn that into our benefit is just continuing to improve our interview process, just reiterating the fact that the FirstLight Home Care methodology and whatnot. Really, its just continuing facade of the information. Speaker 2: If you have a choice to make? Jason: If I had a choice? Absolutely, I have really enjoyed it. Its been a great company to work for. I decided to know where Im going to be for the next 10-15 years. Ive worked for three large companies and Im the corporate franchise head in existing short-term employees without the benefits. Knowing that you're going to be a part of it, an ownership and really having the ability to call this your own is beneficial to me. What word of advice for newcomers, stick with your plan. Honestly, first develop the plan, knowing that the plan is not going to be ironclad, but you got to continue working through that plan. It changes, be prepared for change. Really, just developing your plans, sticking to it. FirstLight HomeCare is currently accepting inquiries from the following states: Alabama, Alaska, Arizona, Arkansas, California, Colorado, Connecticut, Delaware, Florida, Georgia, Hawaii, Idaho, Illinois, Indiana, Iowa, Kansas, Kentucky, Louisiana, Maine, Maryland, Massachusetts, Michigan, Minnesota, Mississippi, Missouri, Montana, Nebraska, Nevada, New Hampshire, New Jersey, New Mexico, North Dakota, Ohio, Oklahoma, Oregon, Pennsylvania, Rhode Island, South Carolina, South Dakota, Tennessee, Texas, Utah, Vermont, Virginia, Washington, Washington, D.C., West Virginia, Wisconsin, Wyoming.